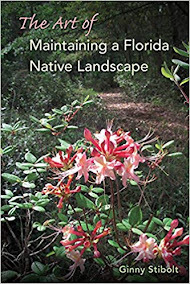 ﻿﻿ Just a reminder to make a comment hereby midnight December 1stto enter the contest to win Craig Huegel's excellent book, "Native Plant Landscaping for Florida Wildlife." You know you want it or know someone who would love to receive it as a holiday gift. 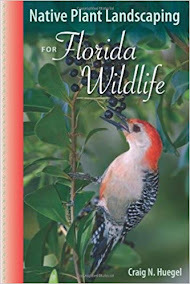 Your chances are very high, because we have two to give away thanks to University Press of Florida. 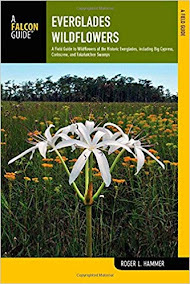 Buy a year's membership in FNPS for someone who'd enjoy learning more about Florida's native plants. If you'll be shopping online for your holiday gifts, FNPS offers merchandise on our store website. (Update: the store is not available at this time. Sorry. 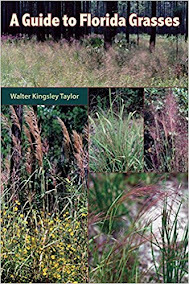 )You may also use our link to Amazon to purchase not only the great Florida plant books we have listed, but anything else that Amazon of fers. 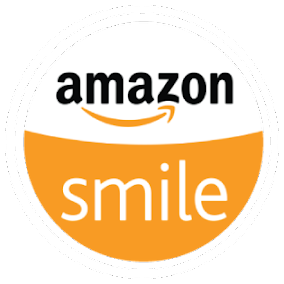 By using our link, FNPS receives a small referral fee for everything you buy. Plan to use Our Good Search and Good Shops button, which also benefits FNPS every time you use it. Purchase gift certificates from your local native plant nursery to give to your neighbors who have been admiring your more naturalized landscape. 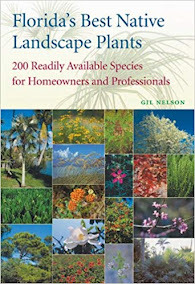 ﻿﻿The groundseltree (Baccharis halimifolia) occurs throughout Florida according to The Atlas of Florida Vascular Plants even though Gil Nelson's "Florida Best Native Landscape Plants" lists its planting zones as 5 through 9. 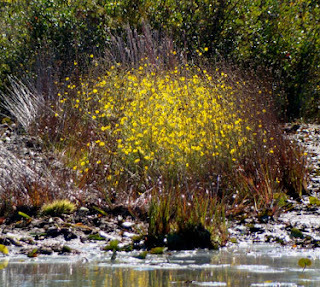 It thrives in many conditions from wet and brackish to sandy, dry, acidic or alkaline. This evergreen shrub has wedge-shaped, irregularly-lobed waxy leaves and can grow in full sun or partial shade. It naturally occurs at the edges of forested areas. 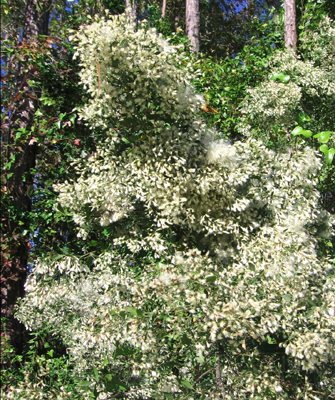 It's best used as part of a mass or hedge row because single specimens can become rangy. They do tolerate trimming if you wish to control the size or produce a neater habit. Groundseltrees also make a good addition to large rain gardens. Our native butterﬂy sage is buzzing with bees and swirling with butterﬂies. Four mockingbirds take turns feeding on the red berries, and two brown thrashers sift through the leaf litter for insects - all within view from our patio. Flowers and fruits are important for wildlife, yet insects and spiders are the main diet of young, growing birds. Many species of native insects eat the leaves, buds and seeds of our native plants, while only a few have gotten past the chemical defenses of introduced exotics. Thousands of caterpillars and other insects and spiders are hiding in most large native trees. During the nesting season, it is important to have these trees so as to supply the insect food for our next generation of birds. Insects contain more protein than beef does. Want to See Julias? You've Got to Plant Natives! Poor poor South Floridians; we can't make a trek to a real pumpkin patch to celebrate the fall season. And if we buy a real pumpkin from a fake pumpkin patch, it turns to mush on our doorstep in about two days, if we're lucky. 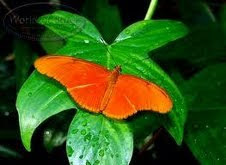 But we can enjoy the most orange butterfly on the planet right in our own yards if we go native with our plantings! This extract is from an article in the Native Roots series, written by Jeff Nurge, a member of the Palm Beach County Chapter of FNPS. It runs a couple of times a month in the Palm Beach Post. On Saturday November 6, 2010, the Ixia Chapter and Sea Oats Chapter took a joint field trip to the Okefenokee National Wildlife Refuge (ONWR), East Entrance. The trip was well organized by Ixia president Barbara Jackson, who coordinated with Okefenokee Adventures to guide us on a boat tour. The turnout was big enough to fill four boats with eight people in each boat. The boats can hold more than eight, but the water level was very low due to lack of recent rainfall. The owners of Okefenokee Adventures, Chip and Joy Campbell, and their staff are courteous and very knowledgeable naturalists. They also run a great gift shop and lunch counter at the boat basin inside the ONWR. And now for something else completely different. Occasionally it comes to our attention that not everyone likes native plants. This fall, I shared with some people from my FNPS chapter a link to an article telling about some new research that Doug Tallamy is doing. 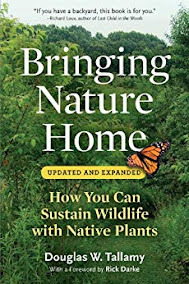 You may remember him as the author of Bringing Nature Home. After he had read the new article, I received this reply from a chapter member who had recently started his own landscaping business. And now for something completely different! 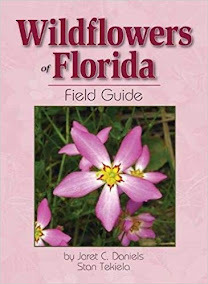 Arranging with Florida's native flowers is easy and fun. Not to mention economical. Even a couple of stems in a miniature holder placed on shelf or ledge are such a treat when you bring them outside indoors. Here are a couple of ideas to get you started. There is always something interesting to put in an arrangement if you have a native yard. Fall is a time when the wildflowers are at their peak in Florida, so its easy to gather a bunch of things you like and stick them in a container. Sometimes people are put off doing their own arrangements because they are worried about design rules, or because they think they aren't "artistic." But honestly, you don't need to know any rules, although I will give you a few. The beauty is in the plants themselves. Let's get started! Join the Pawpaw Chapter of the Florida Native Plant Society for a full day of fun at the Daytona Museum of Arts and Sciences, Saturday November 13th 9:00am to 3:00 pm. The east coast dune sunflower (Helianthus debilis) is one of Florida's 14 native sunflowers and one of three that are widely available in the native plant trade according to Gil Nelson's Florida's Best Native Landscape Plants. I purchased a plant this spring at a gardenfest and planted it in a hot dry area out next to our mailbox. To say that it's done well is an understatement. The flower heads are about 2.5 inches across and they are plentiful. I'll have a lots of seed to share with members of my FNPS chapter, but there will be plenty left for the birds. You can see a spent flower in the foreground of the photo to the right.